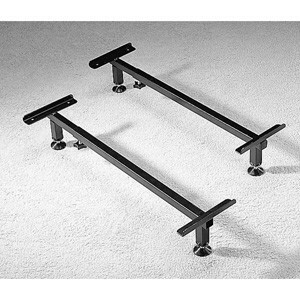 Designed to raise settees with small feet or castors by 75mm (3"). The two included tubular steel frames locate beneath and at both ends of the settee and are screwed into position. The frames are adjustable in size from 610-1040mm (24-41"). A thirdframe is recommended when raising a six or eight castor settee. Weight of single frame: 3kg (6lb). Sold in pairs of two frames. Designed to raise settees with small feet or castors by 75mm (3"). The two included tubular steel frames locate beneath and at both ends of the settee and are screwed into position. The frames are adjustable in size from 610-1040mm (24-41"). A thirdframe is recommended when raising a six or eight castor settee. Weight of single frame: 3kg (6lb). Sold in pairs of two frames.